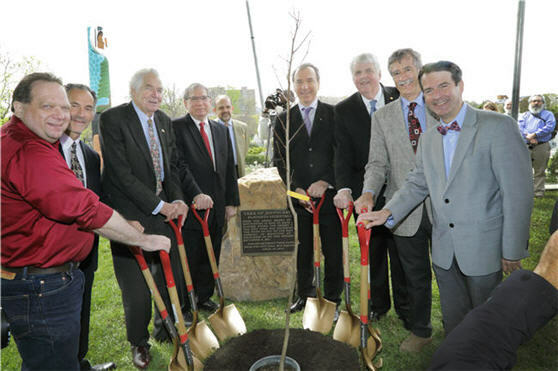 The celebrated Tree of Hippocrates has a new life on the National Institutes of Health campus and a new place in 21st century science. A Tree of Hippocrates clone was planted in front of the National Library of Medicine on April 25, 2014. And the first gene sequence of the tree, which can be used for scientific research, was unveiled during the dedication ceremony. According to legend Hippocrates, regarded the father of modern medicine, taught students under a tree on the Greek island of Cos. When the library was dedicated in 1961, the Greek ambassador presented NLM with a cutting from a descendant of the Cos tree. The tree was planted the following spring. In the 1980s, NIH landscape architect Lynn Mueller detected signs of deterioration from weather and a fungal disease. He spent decades trying to restore the tree’s health while also exploring the possibility of a clone. He eventually connected with the Champion Tree Project, now the Archangel Ancient Tree Archive. Using cuttings from the gift tree, Archangel produced the clone that was planted. It replaces the gift tree which never recovered and was removed last year. 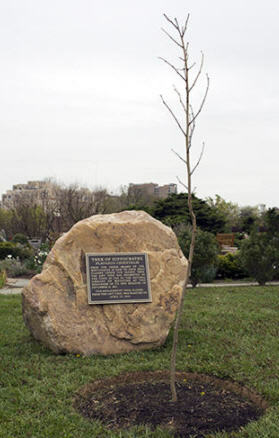 “We are in essence, through science, returning the Tree of Hippocrates to our campus and also renewing, reinvigorating and preserving this historic living monument for posterity,” said Lawrence A. Tabak, DDS, PhD, Principal Deputy Director of the NIH. He noted the planting ceremony was taking place on both Arbor Day and DNA Day. Cloning the tree isn’t the only 21st century twist. 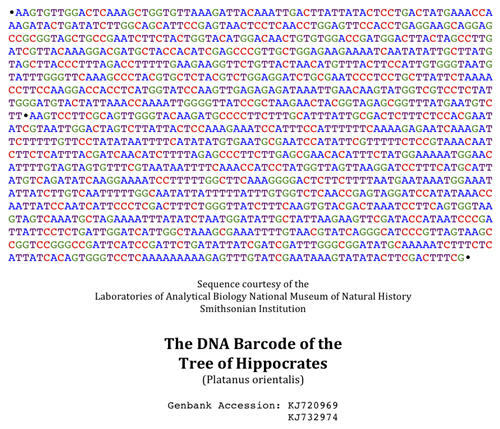 DNA from the gift tree was used to create the first DNA barcode for the Tree of Hippocrates, which is an Oriental Plane Tree, Platanus orientalis (Platanus is the species commonly known as sycamore). A barcode is a fragment, or fragments, of a DNA sequence that can serve as a genetic fingerprint. Amy Driscoll, PhD, sequenced the tree and produced the barcode. She is Project Director for the Smithsonian’s Barcode of Life Project. The sequence is available in the Barcode of Life Database (BOLD) and in GenBank, a comprehensive database of DNA sequences at NLM’s National Center for Biotechnology Information (NCBI). By comparing DNA sequence information that’s stored in these databases and exchanged over the Internet, scientists can further discoveries, explained David J. Lipman, MD, NCBI director. “For some species, the spread in the way they look is so extreme that at times scientists have called them different species. Only after we have the DNA sequence to compare, we see they actually are the same species.” Positive identification, he says, is important to conservation efforts, for example, and for basic research and the study of disease. After the tree planting ceremony, guests were invited to NLM’s History of Medicine Division Reading Room for a special look at historical books and manuscripts influenced by Greek scholarship. To learn more about Hippocrates, please visit the History of Medicine Division blog, Circulating Now. April 29, 2014 in Events, People.